Not peer reviewed. | Get This Duck Away From Me! 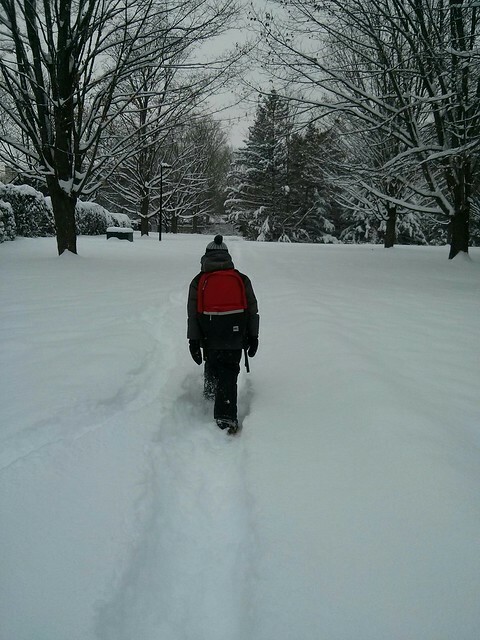 Trevor snowshoed to school during a snow storm. We have toy snowshoes that kept falling off but it did not phase him. He is spending time at friends’ houses and they come over often as well. It is nice to come home and try to guess how many kids are in the house. Trevor’s favourite reading is the Calvin and Hobbes collection. He loves playing Minecraft. Trev is planning on working on his art so we will have to go buy some paints at some point. The other day I caught him watching some weird content on YouTube. T: I’m trying to learn why animals eat people and how to stop them from eating other people. B: That is a very good question and worthy of research. But YouTube??? B: What were you watching? T: “Ten animals that ate their owners”. I guess we have to work on media literacy. This entry was posted in Generally being cute on December 15, 2016 by Mommy.